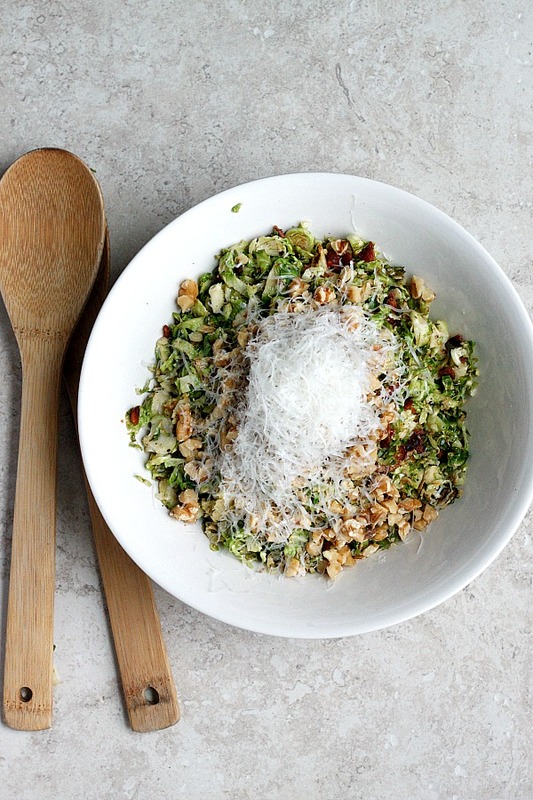 A warm bacon and brussels sprouts shredded salad tossed with chopped walnuts and fresh parmesan. So tasty, and can be served as a side or main meal! Please tell me you like brussels sprouts, tell me you’re not afraid of them, and tell me, that if you claim to not like them, then you’ll throw the gauntlet down and try this, and then if you still don’t like them, I’ll accept it. However, I just don’t see that being the case. I see you falling in love. I mean, really, WHO hates anything cooked in bacon grease, with more bacon, and cheeeeese. Nobody, that’s who. I make this two different ways, depending on the quantity. 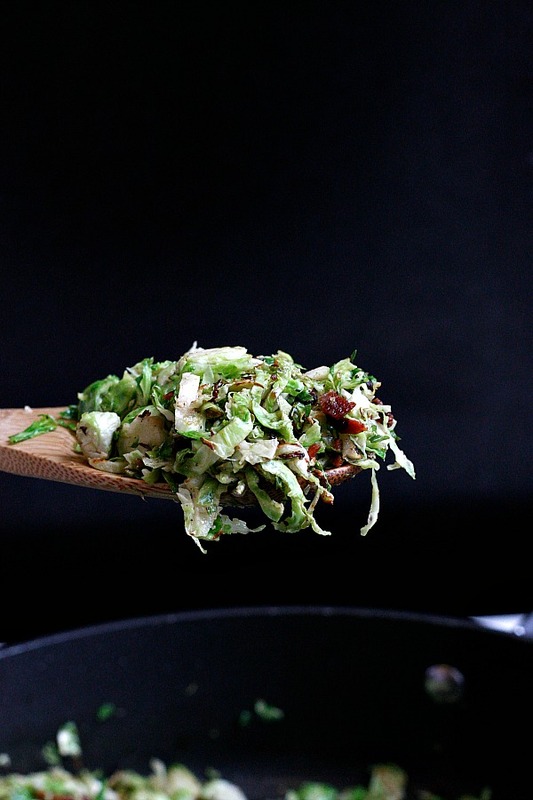 If I’m making mass amounts, (like doubling or tripling the recipe below), then I do it in the oven, same set up..cook the bacon, toss the shredded brussels in the bacon grease, a little salt and peppa, then roast them til golden brown, tossing occasionally, remove and toss with all the rest of the goods. Orrrr, if it’s just a couple of us, I do it right on the stove, as explained below. Totally up to you, and either method gives perfect results. This is one of my most favorite sides or even main dishes! 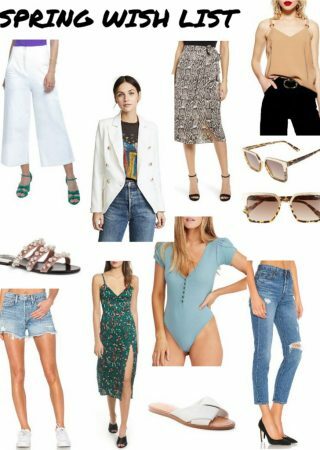 I’ve been making this for years, I even talked about it in my sons birthday recap last year, and forgot to make it for this here blog. But it’s quick and so easy, and SO good. I definitely recommend this one on your turkey day table! In a large saute pan over medium-high heat, cook the bacon until crispy. Transfer slices to a paper towel lined plate, reserve the bacon grease in the pan. Cook until the begin to turn golden brown in areas, tossing occasionally, about 5-8 minutes. 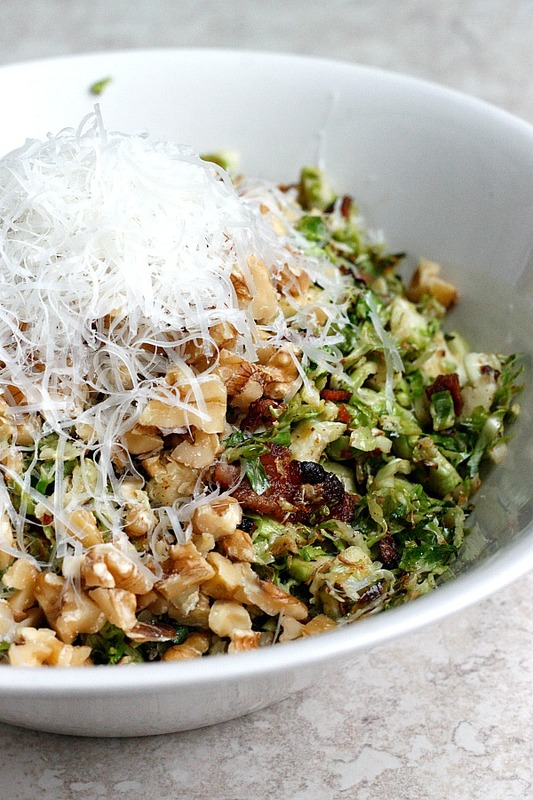 Chop the bacon, add it back to the brussels and toss together. Remove from the heat and transfer to a bowl. 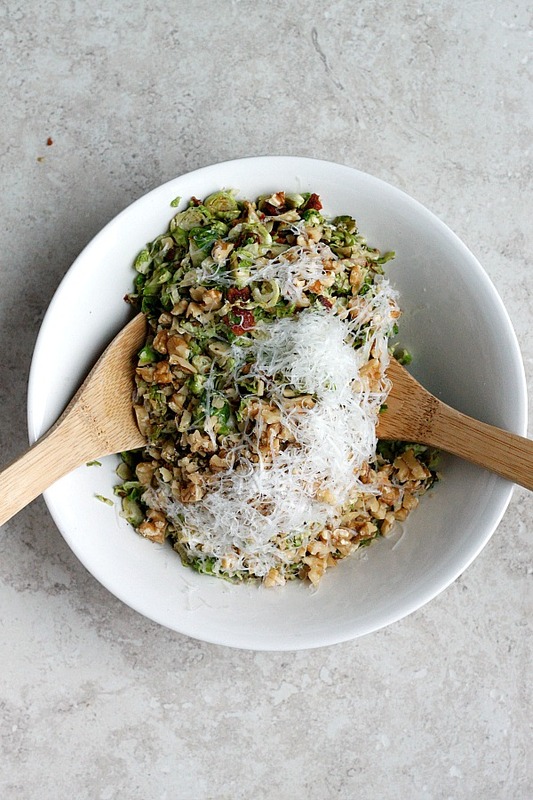 Top with walnuts and parmesan and serve warm. If you're doubling or tripling this recipe, which I do for a bigger crowd, you can cook them on a baking sheet in the oven. Still cook the bacon first, toss the shredded brussels in the bacon grease, spread on a baking sheet with a little salt and pepper, and roast at 425° for 15-20 minutes, tossing occasionally, until the edges are golden brown. Remove from the oven and toss with the rest of the ingredients.